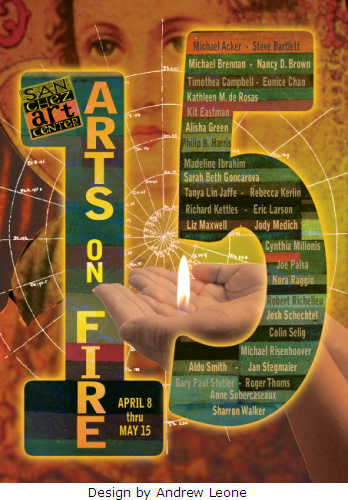 Sanchez Art Center’s 15th annual Arts on Fire exhibit opens Friday, April 8, with a Gala Reception, and will be on view through May 15. Juried by Alison Gass, Assistant Curator of Painting and Sculpture at San Francisco Museum of Modern Art, the exhibit comprises 40 artworks by 31 artists, chosen from 348 artworks submitted by 116 artists. The Main and West Galleries will be filled with paintings and drawings, some very creative mixed media pieces, sculptures large and small, great photographs, and beautiful ceramics. The selected artists are: Michael Acker, Steve Bartlett, Michael Brennan, Nancy D. Brown, Timothea Campbell, Eunice Chan, Kathleen M. de Rosas, Kit Eastman, Sarah Beth Goncarova, Alisha Green, Philip B. Harris, Madeline Ibrahim, Tanya Lin Jaffe, Rebecca Kerlin, Richard Kettles, Eric Larson, Liz Maxwell, Jody Medich, Cynthia Milionis, Joe Palsa, Nora Raggio, Robert Richelieu, Michael Risenhoover, Josh Schechtel, Colin Selig, Aldo Smith, Jan Stegmaier, Gary Paul Stutler, Anne Subercaseaux, Roger Thoms, and Sharron L. Walker. and talk with the Arts on Fire artists about their work. Arts on Fire XV opens Friday, April 8, with a community celebration that offers art, music, food, and entertainment galore from 6 to 9 pm. This is a free event that has been provided by the Sanchez Art Center since it began. Our sponsors this year include Bleyle Elevator Co., First National Bank, Art Guild of Pacifica, and Pacifica Performances. Enjoy free performances by Asia & Arabesque Belly Dance in the Mildred Owen Concert Hall, musical duo Vivace! in the East Gallery foyer, and Doug of Rock Steady Juggling along with Heart of Earthcapades in the courtyard. Visitors can purchase BBQ beef and veggie burgers as well as dreamy desserts, browse the Art Boutique for bargains, participate in Do-it-Yourself Arts Activities, and tour the Ceramics Lab during free demonstrations. There are different stories about how the name Arts on Fire came about and what it means. Many people assume, understandably though incorrectly, that all the artworks should concern the theme of fire, or be created in a medium that uses fire, such as ceramics or metal work. Arts on Fire used to be held around Valentine’s Day in February, and because of that date, Arts on Fire posters often used images of hearts as well as fire, causing some confusion about whether the title was ever Hearts on Fire. (It was not.) 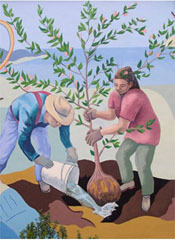 However, the real impetus for the current title, Arts on Fire, is the fire of the creative spirit that took on form and manifested in the creation of the Sanchez Art Center fifteen years ago by dint of the vision, passion, personal commitment, and really hard work of the artists and volunteers who created the center. As Sanchez co-founder and studio artist Andrew Leone put it, “A creative flame had been ignited in Pacifica.” The poster image, also created this year by Andrew Leone, commemorates that first beginning and celebrates what Arts on Fire has come to mean. Sanchez Art Center is located at 1220 Linda Mar Blvd., Pacifica, 1.5 miles from Highway 1, in the buildings with the colorful mural facing the street. Following the April 8 opening festivities, galleries are open to the public Fridays, Saturdays, and Sundays from 1 to 5 pm, through May 15.